However, Tony was, for many years, a successful road racer and is a multiple champion. He was actively involved in the rise of the Honda works teams in Europe and was regarded as one of Honda’s most valuable development and long distance riders during the late part of the 1970’s and early 1980’s. Tony had a strong association with Kenny Blake and he graciously made time available to record his recollections of Ken the man and the racer. I started out asking him about his association with Ken in the early 70’s. He recalled that Ken and he had ridden against each other many times during the early part of Ken’s career. At the Australian TT in 1973, Ken and Tony met in the 125cc and 250cc races. “He kept me honest.” Tony said. Tony also rode against Ken when Ken was riding the Ron Angel Ducati earlier on than this. During these years their paths crossed often. At the Australian TT at Warneroo Park in 1974, Tony and Ken were two of very few eastern states riders who made the journey over the Nullabor. Ken took his 350 and Tony his 125 and 250. On race day it rained. “We cleaned up,” recalls Tony. Much later both Hatton and Blake would become to be regarded as the best wet track riders in Australia. Few who saw it could forget Hatton’s awesome win in the Inaugural Arai race at Bathurst, hustling the 900 Honda across the top of the mountain at barely reduced pace while the track was so shrouded in rain and mist that visibility was reduced to nothing. I then asked Tony for his recollections about the Castrol Six Hour races. Tony rode with Ken to second place in 1976 and was due to ride with Ken in the 1979 race, but fell in practice and cracked a sternum. His place was taken by John Warrian and the team eventually finished 8th. As a team mate, Tony could not speak highly enough about Ken. “He was great; easy to get on with and he didn’t seem to worry about any of the changes we had to make.” The BMW R90S had ground clearance problems around the tight Amaroo Park layout and it was hard to get a tyre that would perform well and lift the bike up enough so that they could corner quickly. After all the effort to get it right and fast enough, this was what it had come down to. “I thought that Ken would just walk out. The setup was so bad.” BMW’s were VERY sensitive to tyre/rim combinations and Tony went into the race by no means confident. In the race, Tony say, “We were robbed.” Both Ken and he had long experience of riding Six Hours solo, and since the rules required two riders, both felt they could do their sessions flat out. Ken would ride the first and last stint and Tony the middle one. The bike was flying once the race settled down and looked like winning, when a clutch problem during the middle stage brought out a long pit stop. The BMW executives there for the race were worried the bike would crash if pushed to the limit and advised a cautious pace for a finish. Ken was advised of this by pit signal and settled into lapping consistent high speed laps, now running in second place. Ken rode fast but conservatively. He was so close to the leaders, Jim Budd and Roger Heyes, that he could see them on the track in front of him in the closing stages. Ken soldiered on to finish a fine second. When the lap charts were shown to him afterwards, he was shattered. “Why didn’t you tell me we were that close? I could have passed them easily.” he said. Ken had done exactly what the team required and they had completely underestimated his ability to push for the lead safely. 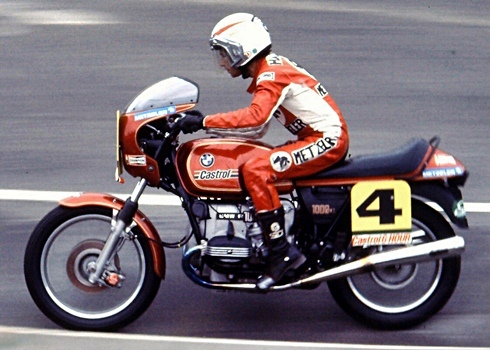 Team BMW’s stop watches show that they missed the win by just seconds, but, because of the odd nature of Lap Scoring at Amaroo and the fact that the race was flagged off on the short straight between Stop and Rothmans with all places frozen at the exact time when six hours had elapsed, the team was actually officially shown as one lap down on Budd and Heyes. I sensed that, while Tony was relating this incident, this fact still rankled, even after all these years. I then asked Tony about the next time he rode with Ken which was the Bol D’Or at Paul Ricard in France in 1979. Tony was set down to ride with Michael Cole, another Australian long distance expert. (Cole had given the amazing CBX1000 six cylinder Honda its debut win in the Calder 2 Hours the year before). They were set down to ride the 1100cc Honda that had been ridden to a win by Cole in the recent Suzuka Eight Hours endurance race in Japan. Hatton especially was the “flavour of the month” with Honda executives (my recollection, not his). Honda sensed his enormous ability as an engineer and development rider and they used him accordingly. Tony had already ridden a Bol D’Or, but it was all new to Michael. Tony spent some time explaining the track and especially pointing out a large pot-hole that was right on line in one of the stop corner chicanes. He counselled Mike to be very careful as the French did not maintain the track well. As bad luck, would have it, Michael found the pot-hole on the second lap of practice, fell off and broke his leg. The bosses from RSC (Honda’s racing development arm) advised, “Ring Crosby.” Tony knew Croz well and knew that he was a devastatingly fast sprint rider, but he felt that Croz did not have the mechanical sympathy to pace himself and the bike for a 24 hour race, which was the length of the Bol D’Or. The RSC execs then suggested Kenny Blake. Tony knew that Ken was available, but was still reluctant. By this stage he had had some weeks of practice, Honda having booked the track for many private sessions. Tony was worried that Ken would be “thrown in at the deep end.” Kenny was in England racing TZ250 and 350’s and Tony was worried that he would find it very hard to adapt from that type of racing to an endurance race on a big, ferocious four stroke. The RSC execs insisted, however, and, by the time Kenny arrived later that week, practice was over and qualifying had begun. Ken asked Tony what the bike was like. Tony replied, “It’s a bit of a tank but it’s deadly fast.” Honda was experimenting with all sorts of tricks and Tony’s Honda was really a prototype, a rolling test rig, for the new technology. However, the very next session, Ken was out on the bike again and was right on the pace. “It just blew me away,” Tony recalls. There was a window of a couple of seconds in which all the competitive times were being set and Ken just dropped straight in there. The bike was fast but economical and it was looking good. Tony pitted and handed over to Ken who promptly got off line and dumped the bike in a sand trap! The bike was returned to the pits by a very sheepish Ken. “Nerves gone.” was the comment. The damage was repaired and the bike went back into the race, climbing up through the field like a rocket. “Ken had the ability to go fast and still look after the bike.” At each pit stop as the race wore on, Ken would say to Tony’s wife, “Tony’s looking pretty ragged.” Tony would say the same as Ken pitted! But still they maintained their pace and the lead. Then, at the 15 hour mark, the exhaust system fell off. The team lost 15 minutes in the pits effecting repairs. Despite this they still worked their way back to the lead. At the last pit stop beginning the last hour of the race, Tony handed over to Ken. “She’s shot!” was the advice. The motor was losing power and rattling alarmingly. The team was secure in third place with the fourth place bike too far behind to be a threat. Second place was too far ahead, so the decision was to soldier on for the third place. However, Ken had only been on the bike for a few laps after the last stop when the bike stopped. Honda gave out that the bike had thrown a rod, but Tony is convinced that the gearbox seized, it stopped so suddenly. The fallen bike caught fire and burnt to the ground. There was only half an hour to go, after nearly 24 hours. The team was finally credited with eighth placing on the basis of laps completed. On the basis of their performance, Honda offered Ken and Tony a contract for a year to compete all the European rounds of the Endurance Championship. Tony had already decided to start scaling down his racing but Ken decided to take the deal as he was purchasing a business and felt that the money earned would set him up. Honda teamed him with the Americans Dave Aldana and Mike Baldwin, but Blake was unquestionably the #1 rider. Ken did all of the testing and development and much of the practice and qualifying, but, because Honda had a strong interest in the American market, all the publicity about this season centred on the American riders. Sadly, neither Aldana or Baldwin were as good as Ken at finishing races. Both were accomplished sprint racers, but both lacked the discipline needed to be successful at the long distance game. So the team’s results failed to live up to expectations. “Ken never got the recognition he deserved and, in retrospect, it turned out to not be a good deal for him at all.” So he returned to England and concentrated on sprint racing with his TZ’s. I asked Tony how he’d rank Ken compared to his peers. Tony said that he was the equal of them all; Toombs, Hindle, the early Hansford. But he could be trusted more than most as well. “If you pushed him hard, you would know that he wouldn’t crack or do something silly. Not all the riders that were regarded as great riders in that day were as reliable.” I asked how he felt that Ken ranked against the current crop of GP riders. Tony was adamant that, had Ken had the breaks that Gardner, Doohan, Beattie etc had had in the early part of his career, he would have most certainly gone on and won World Titles. My thanks to Tony Hatton, a very busy man, and a respected champ in his own right, for sparing me the time to record these reflections. I find it fascinating that everything Tony said reflects the approval and admiration that everyone else who knew Ken had for him.